Overview: We've seen them on the television and in the media, but now they're here to rock you in their very own Video Slot! The highly anticipated Osbourne's Video Slot is here, and ready to welcome you in to their dysfunctional, but definitely rocking family. Join Ozzy, Sharon, Jack and Kelly as The Osbourne's offer a full house, jam-packed with great opportunities to score Free Spins, multiplier boosts and solid cash prizes. With slamming good features that will keep you guessing, The Osbourne's offer great chances of winning, with Mini's Trail Bonus, The Knock Knock Bonus and the randomly selected Grab a Gift Bonus Feature. This eclectic video slot is enthralling, exhilarating and full of wow - it is The Osbourne's after all and one wouldn't expect anything less. 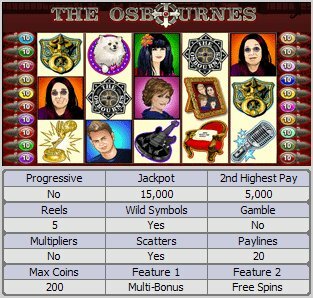 Similar Slots: If you like The Osbournes, you might like these other 5-reel slot machines: Deck the Halls, Jonny Specter, Reel Strike, Snow Honeys, Star Appeal, TallyHo.